Group photo of the Brea Centennial Steering Committee. Cindie Ryan-city empl., John Bickel-historical society, Barbara Ott-school district, P.J. Smith-Lions club, Joanne Todd-senior center, Mayor Christine Marick, Sean L. Matlock-city empl., Heidi Gallegos-chamber, Liz Pharis-city empl., and Bill Higgins-Rotary club. Bottom row from left to right: Denise Terrazas-member at large, Bev Perry-past city council, Keith Fullington-member at large, Wendi Gensel-city empl., Mayor Pro Tem Cecilia Hupp, Carrie Hernandez-city empl., Pat Tremayne-city empl., Amber Ahlo-city empl., and Carolyn Campbell-member at large. Not shown: Holli Kittleson-city empl. and Coley Fisher-member at large. Last evening was our first of many meetings to come in planning Brea’s centennial celebration 2017! The group is comprised of nine city employees and 20 community members. Twenty-seven were present last evening at the Brea Community Center. The green t-shirt that former Mayor Bev Perry is holding up in the photo dates back to Brea’s Jubilee Parade in celebration of Brea’s 75-year anniversary. Longtime Brean and Assistant City Manager/Community Services Director, Chris Emeterio, actually wore it on that special day. The meeting was two hours long, with the last hour spent brainstorming. We have an amazing group of enthusiastic people. The journey has just begun and there were so many creative ideas! We'll take you along the way in keeping you informed as decisions are made and let you know when we need your help. Because after all, this is a once-in-a-lifetime-event! It was the must-have holiday item of 2015, yet it was banned almost everywhere from Great Britain and New York to individual stores and malls. It was on the top of every kid’s (or adult’s) wishlist, yet large companies like Amazon and Target stopped selling them. It was the hottest, new tech fad costing up to $1,000, yet there were dozens of reports of it catching on fire. And now, as of Jan. 1, it’s legal to ride them in the state of California. Known as hoverboards, these self-balancing electric boards are the latest gadget craze coveted by children and adults alike. And according to a new California bill effective Jan. 1, all motorized wheeled devices, including hoverboards, can be used anywhere bicycles are allowed to go to accommodate commuters in bicycle and car traffic. The new law requires some regulations, however, such as an age requirement of 16 years old and the wearing of a helmet and any other safety gear while riding. Although the law legalized hoverboard use in public, it allows local governments to regulate the motorizing board, giving communities the right to ban them or penalize them as they choose. In the city of Brea, there are no specific regulations regarding hoverboards as of yet, but they will be treated the same way as skateboards until further city rules are made, according to Brea Traffic Sergeant Tim Mercado. 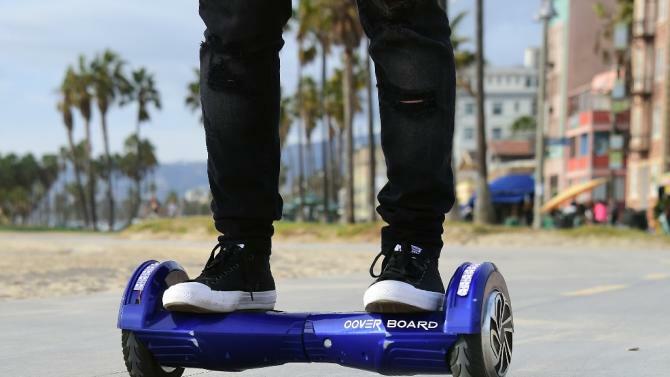 Although there are no safety requirements imposed by Brea law enforcement, Mercado strongly recommends that younger hoverboard riders wear a helmet and elbow/knee pads, while avoiding conflict with vehicular traffic. “As with any new toy or vehicle that children operate, I believe good old common sense should be the dominating theme when these devices are operated anywhere in regard to safety equipment. There will likely be push-back from whatever safety equipment we as parents will suggest to our children, but safety should always be the first consideration,” Mercado said. The new bill overturns the previous law in 1977 which prohibited motorized skateboards, mostly because of their gas emissions, a feature that does not apply to most modern electric boards today. But with the new law, hoverboard owners are free to skate in public as long as they meet the safety and traffic requirements. BOHS MUN members will compete at the UCLA MUN conference. Brea Olinda High School’s Model United Nations club will attend the 23rd Bruin Model United Nations conference at UCLA today and tomorrow, competing against other high school students from all around the world. BOHS will be sending delegates Charlotte Kim, Stacy Uhm, Jane Lee, and Ashley Kim to represent the country of Vietnam along with club advisors Eugene Lee and Amanda Hefner. Junior Jane Lee and sophomore Ashley Kim, both club co-presidents, will compete as one of the four Crisis committees, a level typically designed for seasoned delegates who apply their knowledge of history and critical thinking skills. “I’m excited to attend the conference, but I’m also nervous because I have no idea what to expect at such a big conference,” Lee said. Juniors Charlotte Kim and Stacy Uhm, the latter joining the team this year, will compete at the beginner level committee, which are smaller in size and designed for novice delegates. “I’m really excited to go to the conference this year. I think it’s a great opportunity, especially since it’s at UCLA, and I’m so grateful to get the chance to be a part of it,” Uhm said. The students have been preparing for the conference by working on their position paper and researching about Vietnam. They have also rehearsed their opening speech for the conference, a speech that they must present under one minute. This is the first time that the BOHS Model United Nations club has attended the UCLA conference, last competing in two small conferences in 2013. In 2013, the club won several awards in the past, such as Best Delegate, Outstanding Delegate, and Commendations. Last year, however, the club did not compete in a conference, mostly due to lack of interest. This year the club hopes to win awards again and relies on the team’s hard work and dedication to get them through the conference. “My goal is for all of us to win awards at the end of the year, and I’m confident that we will,” Lee said. The BOHS Homecoming Dance kicked off last night at the Balboa Pavilion in Newport Beach. With the theme “A Night to Treasure,” students were free to bust some moves at the dance floor, relax on an evening boat tour aboard the Balboa riverboat, and enjoy the rest of the night at the beach’s Fun Zone where they could ride the ferris wheel, the bungee assisted trampoline ride, and even play in some arcades. Once again, the Dance was hosted by the BOHS Girls’ League, who worked hard to organize the event. And all their hard work paid off as the students were buzzing with excitement throughout the night. The night before the dance, the senior Homecoming queen was announced at the BOHS Homecoming football game. Libby Williams, senior, took home the crown, along with the other Homecoming princesses, junior Hannah Towbin, sophomore Jennie Pendergast, and freshman Amanda Acaba.